Who, what, when, where, how!? I’ve had an unfortunate couple of days in my personal life so I took those days off crypto to get myself sorted and LORRRRDY was I shocked upon my return. I like many of you were lulled into a false sense of security and boredom with both the crypto market cap and Bitcoin sliding sideways. Well, I’m not bored anymore. Luckily prior to my couple of days off I took a little profit, I’ve since reinvested that. The buzz on the crypto street is one of conspiracy, confusion, outlandish complex ideas of why we “plummeted” but in reality, markets move and not everything needs to be picked through for answers. I think the best answer is the simplest… we’ve been in a bear market, case closed. Bitcoin capitulation or bear trend continuation? Well, as the chart I’ve put together shows… a reversal. 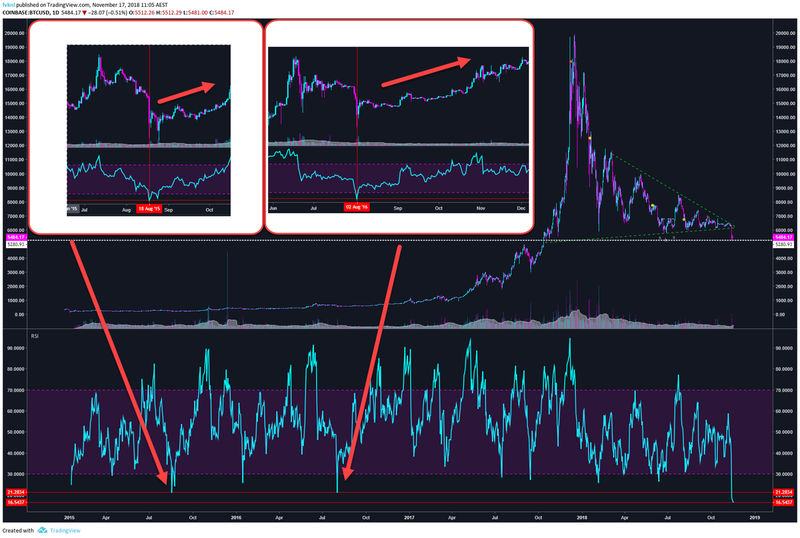 After the final capitulation and a smack down of the RSI the Bitcoin trend reversed. Now, does this mean it will happen again? No. However, statistically speaking it does favour a reversal and this might just be the final capitulation we’ve all been waiting for. As I mentioned above I taken this opportunity to pick up a few positions in the crypto market. Keep an eye out for good opportunities, there are plenty right now.